Posted June 11th, 2015 by Al Broberg & filed under Blog. This is another piece on the world’s famous and historic diamonds, although not reprinted from Rapaport magazine, as the blog on the Hope Diamond was. This information comes from the GIA course materials that I happened across when looking up a diagram that I wanted to use for a facebook post. The Orloff, like so many of the world’s oldest and most famous diamonds traces it origins to India. In the 1700s, it was (so the tradition goes) one of a pair of diamonds that served as the eyes of an idol in one of southern India’s holiest shrines in the city of Srirangam. It was stolen by a French adventurer – France and England were then battling for control of India and its wealth. He took the diamond to Madras and sold it to an English sea captain for 2000 pounds sterling. It then changed hands several times ending up in Amsterdam where it was shown to the Russian count Gregory Orloff. When Napoleon’s Grand Army was about to enter Moscow in 1812, the Russians hid the diamond in a priest’s tomb. Napoleon discovered the gem’s location and was about to claim it as one of the spoils of war, when, according to legend, the priest’s ghost appeared and pronounced a terrible curse on the desecrators. Napoleon fled in fear without the diamond. 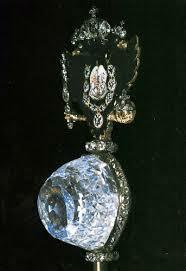 Today, the 189.60 carat Orloff remains where Catherine the Great placed it, atop the Imperial Sceptre.